Spider veins appear just beneath the surface of the skin as webs or clusters of red, blue, and purple. Many patients believe them to be harmless, albeit unattractive. However, in some cases spider veins are more than a cosmetic issue. They signal an underlying vein disease like Chronic Venous Insufficiency. Fortunately, there is a cure for spider veins. Today’s treatments are fast, effective, and minimally invasive. Your vein doctor in New York or vein doctor in New Jersey can help you choose the vein treatment method that is best for you. Though it is sometimes possible to glimpse healthy veins under the surface of the skin, particularly in those that have a light complexion, healthy blood vessels are generally not visible. When they protrude against the skin with a thick, twisted, rope-like appearance, they are referred to as varicose veins. 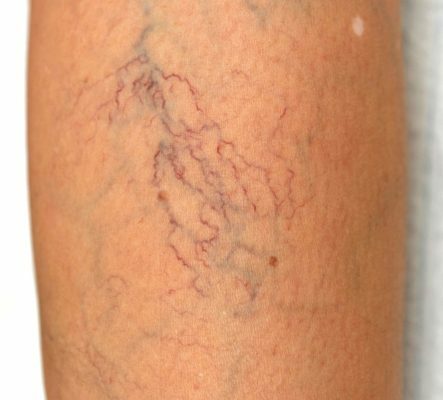 When you can see a web or cluster of thin red, blue, or purple veins just beneath the surface of the skin, they are referred to as spider veins. In both cases, the veins are not functioning as well as they should be. After your arteries distribute oxygenated blood throughout your body, your veins are responsible for carrying the deoxygenated blood back to your heart. It can be challenging to move blood from your lower half to the heart, because the vessels must work against gravity. A series of tiny one-way valves inside the veins helps the process along by ensuring that blood travels in the right direction. If the valves are damaged through injury or disease, blood can leak backwards. Veins with damaged valves are unable to function effectively, so blood pools in the lower part of your body – particularly the legs and ankles. The pooling blood puts pressure on other valves, as well as the vessel walls. As pressure increases, the vein wall is weakened, and the vein begins to swell. This creates the spider veins and varicose veins that you see. One of the most common causes of varicose veins and spider veins is a condition called Chronic Venous Insufficiency (CVI). Unfortunately, physicians who do not specialize in venous disorders frequently fail to diagnose this disease correctly. As a result, they tend to treat the symptoms – spider veins and varicose veins – without addressing the underlying issue. If you are experiencing any symptoms of vein disease, such as varicose and spider veins, it is important to visit your vein treatment center to ensure an accurately diagnosis and an effective treatment plan. Though varicose veins and spider veins are the most obvious symptoms of vein disease, you may be experiencing other signs as well. Many patients notice swelling in their legs and ankles, and legs may feel sore, achy, and heavy. You may notice that your skin is itchy or tight, particularly near the swollen veins. Leg cramps are common, especially at night, which can disrupt your sleep. You may also develop Restless Leg Syndrome, which is marked by a feeling that your legs need to move or stretch, even when you are relaxed. If the disease progresses untreated, symptoms can become more serious. For example, skin around the ankles may become discolored and extremely fragile. Relatively minor cuts and scrapes can turn into wounds that are slow to heal. This allows bacteria to enter, and skin infections like cellulitis may follow. Who is at Risk for Vein Disease and Can It Be Prevented? More than half of all Americans will experience varicose veins and spider veins at some point, though not all of these cases are caused by CVI. Two of the biggest risk factors for various venous disorders include a family history of varicose veins and spider veins, and a sedentary lifestyle. While nothing can be done about a genetic predisposition to vein problems, you can reduce your risk by staying away from smoking, maintaining a healthy weight, and making it a point to exercise regularly. Even simple activities like walking increase circulation, which helps to keep your blood vessels working effectively. If you need to spend long periods of time sitting or standing, be sure to take regular breaks and move around. Too much inactivity gives blood a chance to pool in the lower part of your body. Finally, if you know you are at high risk – for example, during pregnancy – consider wearing compression stockings to promote circulation in your legs and ankles. What Is the Cure for Spider Veins? Chances are, if you have spider veins or varicose veins, you have gotten a lot of advice on home remedies. For example, many people use witch hazel and/or products made with horse chestnut to reduce the pain and inflammation associated with swollen blood vessels. These options can be helpful in keeping your discomfort to a minimum, but they are unlikely to solve the problem long-term. A truly effective cure for spider veins and varicose veins requires intervention from an expert. Your vein doctor in NY or vein doctor in NJ has a variety of methods to treat varicose veins and get rid of spider veins. Most are designed to permanently close unhealthy vessels, allowing blood to automatically reroute through healthier veins. The tissue from the closed veins is reabsorbed by your body, eliminating the appearance of varicose and spider veins. Typically, treatment is delivered through a very small incision in your skin. The unhealthy vein is sealed through the use of medication, heat, laser energy, or vein glue, depending on your specific situation. Your vein doctor uses a local anesthetic, rather than general anesthesia, so there is no need for a hospital visit. These procedures take between 15 and 30 minutes, and you can resume your normal activities right away. Note that physicians in other specialties may offer an alternative cure for spider veins, such as a surface laser treatment. However, there are two reasons that you should consider visiting a vein specialist instead. First, surface laser treatments are often ineffective. Second, a comprehensive exam from an experienced vein doctor ensures that if there is an underlying condition like CVI causing your varicose veins and spider veins, it will be diagnosed before symptoms become more serious. How Do I Choose a Vein Specialist? There are two important factors to look for in a vein specialist. First, review the physician’s qualifications. Any doctor you consider should be Board-Certified, with specific education and experience in venous disorders. Second, choose a vein specialist that makes the relationship between physician and patient a priority. The quality of your care will always be higher when you and your vein doctor have open, two-way communication. The Board-Certified physicians at the Vein Treatment Clinic are focused on putting patient relationships first. You can expect to be treated as a partner, and you can be confident that you will receive an accurate diagnosis and a comprehensive treatment plan that is carefully tailored to your situation. Visit the Vein Treatment Clinic online to schedule an appointment or call 855-807-4936 to speak with a member of the staff.